It was 1973. It was the golden age of Secretariat and the days of Arcaro and Shoemaker... but it was one rider above them all who drew the racing world's rapt attention. That was Walter Blum. To count himself among the truly great he would have to win the 4,000th race of his career. He needed six more. That pursuit and so much more about the racetrack inspired international bestselling novelist Jack Engelhard to produce a factual journalistic account of what it's really like behind the scenes. His book, The Horsemen, became an instant classic. The New York Times devoted a full spread on its Sports front page to excerpt and celebrate the book. "Racing has found its laureate." Thus cheered famed New York Post racing writer Ray Kerrison writing for the pages of The National Star. 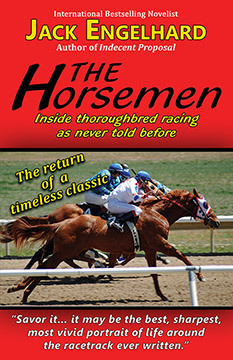 The Horsemen continues to draw acclaim from readers throughout the racing world and from readers who simply enjoy a great book. "If you love racing, you owe it to yourself to get your hands on it, read it and savor it, because it may be the best, sharpest, most vivid portrait of life around the racetrack ever written." "In The Horsemen these interesting characters give spice to the backstretch stew from which Engelhard offers us delicious spoonfuls. It's quite a cast and quite a book."